Mosaic Data Science, a leading data science consultancy, revamps employee charitable donation program just in time for the holidays! In an effort to spread holiday cheer, Mosaic has participated in a charitable donation program every December for the past couple of years. In years past, Mosaic has given a $50 charity gift card to each employee to donate to a charity of their choice. This year, we have decided against the gift cards and will send donations directly to up to 10 charities. Mosaic ATM provides innovative solutions the aviation market. Mosaic ATM is a team of exceptionally motivated, skillful, and creative people dedicated to improving the capacity, efficiency, safety, and sustainability of air transportation and advancing the science and application of unmanned aircraft systems (UAS) and other future uses of the sky. Link to the Mosaic ATM homepage. Mosaic to bring highly targeted data science content to the Data Science Central community. Mosaic is excited to deliver cutting-edge content to the community! Link to the Data Science Central homepage. Mosaic highlights two opportunities energy companies can benefit from by using data science, Predictive Maintenance and Customer Voice Prediction. Mosaic has worked with some of the largest utility providers in North America. One of these utilities has identified over $300 million of value by utilizing the data they had already collected! But how does a utility get started taking advantage of these data streams? Interested in learning more? Use the link below to download our Whitepaper done in conjunction with the Utility Analytics Institute! Link to the Utility Analytics Whitepaper Page. Mosaic will be presenting at the 2016 Houston Data Disruptors Conference on July 13th. Mosaic’s Chief Data Scientist, Chris Provan, will be giving a 30 minute presentation on data science applications in the Oil & Gas world. 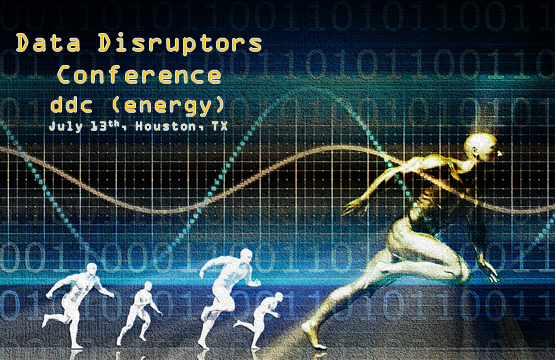 The Houston Energy Data Science organization will be hosting the Data Disrupors Conference. This is an event for data innovators and disruptors to showcase their products and passion in the energy field. Chris will be speaking from 9-930 AM CT. The event will be held on Wednesday July 13th at the Atlas Room. The Atlas Room is located at the following address: 7620 Katy Freeway Suite 100, Houston, TX 77024. Visit the Data Disruptors homepage to learn more! Mosaic to donate data science expertise to the organization ESOP, Empowering and Strengthening Ohio’s People. Mosaic Data Science recently signed an agreement to give back to the community by partnering and providing data science services for the ESOP organization. ESOP or ESOP Realty is a full service housing and financial counseling agency. We help people in every stage of life become empowered to take control of their finances, make a plan for financial stability, and afford sustainable home-ownership. The conference will be held at the Hyatt Regency Grand Cypress, Orlando Floria from Sunday April 10th to Tuesday April 12th. Make sure to drop by Booth #36! Every business… every organization… and every analytics professional, experiences the ups and downs, and the twists and turns of Analytics. Making analytics work in real organizations can be a dynamic (dare we say wild?) ride for even the most seasoned practitioners. Analytics 2016, INFORMS Conference on Business Analytics and Operations Research, will help you to conquer the challenge. Analytics 2016 will bring together nearly 1,000 leading analytics professionals and industry experts (executives, analysts, managers, researchers, data scientists, modelers, etc.) to share ideas, network and learn about a range of topics including Analytics Leadership & Soft Skills, Decision & Risk Analysis, Fraud Detection & Cyber Security, Healthcare, Internet of Things, Marketing Analytics, Revenue Management & Pricing, Sports & Entertainment, and Supply Chain Analytics with special emphasis this year on Big Data and Unstructured Data. With substantial networking opportunities, and focused discussions about the tools, technologies and insights on how to integrate advanced decision-making techniques into effective business processes, Analytics 2016 is your ticket to greater success. 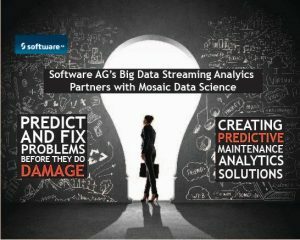 Mosaic co-hosting Streaming Analytics Webinar with Software AG! Software AG’s market-leading Apama platform, layered with the analytical horsepower of Mosaic Data Science results in powerful solutions with an unparalleled breadth of possibilities. The webinar will take place on Wednesday, October 28, 2015 at 2:00 PM ET / 11:00 AM PT. Apama Streaming Analytics enables organizations to respond and react to events in real-time, the moment they happen. With predictive analytics, Apama allows companies to take the next logical step forward by predicting and responding to events before they occur, while the outcome can still be altered. For example: Your predictive risk models correlate behaviors across traders and markets to flag risky trading activity in real time, giving you time to step in and reposition yourself before it’s too late. Or, imagine that while monitoring the vibrations of a motor you learn that it is likely to fail within the next three days – so you can schedule a repair at a point of minimum disruption rather than a time when the production line is running at maximum capacity. Finally, while monitoring a customer’s spending pattern, you notice changes indicative of churn – you can still make a play to retain them before they lapse. Please join us for an interesting and informative discussion with Software AG’s Logistics and Manufacturing Industry Director, Sean Riley, as well as data scientists Mike Shumpert from Software AG and Chris Provan from Mosaic Data Science, a Software AG partner, and learn how predictive analytics combines with streaming analytics to let you understand your business better and build a competitive advantage. Mosaic will be presenting at the premier big data conference this fall with Software AG. The data industry is growing fast, and Strata + Hadoop World has grown right along with it. We’ve added new sessions and tracks to reflect challenges that have emerged in the data field—including security, ubiquitous computing, collaboration, peer analytics, reproducibility, new interfaces, emerging architecture, building data teams, machine data—and much more. Mosaic is happy to announce it will be presenting at Software AG’s Innovation World! Innovation World will be in Las Vegas from October 12-14 and feature more than 1,000 visionaries, 40 presenters, and 50 exhibits in one place! If you are an experienced data analyst or data scientist, please go to our employment page to inquire about current opportunities! Internet of Things (IoT) – I’m confused! Who? What? Where? Why? And How? Who is responsible for IoT in retail companies and who does it impact? What are my peers doing in preparation for IoT? What are the current trends around IoT enabled Smart Shelving, Smart Signs, Remote Body Scanners? Where can IoT be deployed, leveraged and used? Why is IoT relevant to both Business and IT? How can the business leverage data science and scientific techniques? How do I extract actionable insights? How do I take advantage of IoT and show value quickly? Mosaic will be presenting about the impact of predictive analytics and IoT to shape the customer experience at the CIO Roundtable Event hosted by Apparo in Charlotte on June 15th. Mosaic’s President, Chris Brinton, will be giving a keynote address June 4th in Dublin, OH at the PGA Memorial Golf Tournament. Mr. Brinton’s speech will focus on the perils of business under utilizing the power of predictive analytics in today’s corporate landscape. A copy of the presentation is available upon request. Mosaic will be unveiling a predictive IoT solution at CeBIT 2015 in Germany. The conference runs from March 16-20th and will be hosted in Hannover, Germany at the Hannover Exhibition Fairgrounds. Mosaic and Software AG are offering a real-time preventative maintenance solution, focused on saving companies time and money by identifying machine failures before they happen. Mosaic Data Science is proud to announce Chris Provan as the company’s new Chief Data Scientist. Mr. Provan, an operations researcher, brings over a decade of data science consulting to Mosaic across a broad range of industries. Mosaic has been selected as an early-bird speaker at the FOSS4G NA 2015 Conference in San Francisco March 9-12th, 2015. Click here for more information on the presentation. 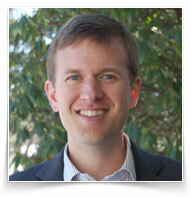 Our data scientist, Jeremy Lindsey, will be giving a presentation on GIS in Air Traffic Management. His talk will focus on how Mosaic has used open sourced GIS software to help optimize the national airways for the Federal Aviation Administration. Please contact Mosaic to learn more about our experience with GIS. Mosaic’s Chief Data Officer, Todd Morley, recently presented at the MIT Chief Data Officer Symposium. His talk focused on what is and isn’t possible with big data, entitled “The Unreasonable Seductiveness of Big Data.” If you are interested in a copy of his presentation, please contact us. Mosaic Data Science and Bria Strategy join forces to bring advanced analytics to the financial vertical. The partnership between Bria Strategy Group (BSG) and Mosaic Data Services (MDS) is the combination of the leading authority in retail banking analytics with the skillset of a top big data and analytics provider in the United States. Leveraging the experience of big data projects like aviation management, where the accuracy and efficiency of their algo-rithms literally keep millions of air travelers safe every year, MDS brings a wealth of experience in delivering not just ana-lytic services, but solutions that continue to deliver value to their clients year after year. Frank Bria, principal and founder of Bria Strategy Group, is the author of the book Seven Billion Banks, speaker, strategist, and consultant to 9 of the top 10 banks in the United States, and 5 of the top global 10. He leads solution development for the partnership to ensure that banking clients leverage the latest technology and analytics to drive better customer experience, more efficient operations, and, in the end, bottom-line results. Mosaic attends the Software AG’s Innovation World 2014 in New Orleans. Mosaic Data Science is pleased to announce that Software AG has selected Mosaic as its first and preferred data-science services partner. Software AG is one of the world’s largest software manufacturers, second only to SAP among German software firms, and has led several global enterprise-computing market segments for decades. (Software AG has 4,000 customers in the U.S. alone.) Its big-data products Apama and Terracota are market leaders in their segments: streaming pattern recognition and in-memory computing. Mosaic in turn has over a decade of experience developing and implementing enterprise-scale analytical models that produce high returns on investment for our customers. Together, Software AG and Mosaic will deliver market-leading streaming-prediction solutions to customers in manufacturing, telecommunications, logistics, medicine, energy, and other verticals where the Internet of things enables perishable insights: high data velocities requiring immediate analysis and response. Contact Mosaic today to learn how our partnership with Software AG can help your company turn real-time analytics into a competitive advantage!